During this process our eye doctors can ascertain the most appropriate lenses based on your vision needs and lifestyle. Here is a brief overview that can help you understand how we help patients choose suitable contact lenses. A vision test that measures your visual acuity. Tests that examine the physical health of your eyes. Tests that detect any refractive errors that cause vision problems. One of our eye doctors will perform an additional exam. 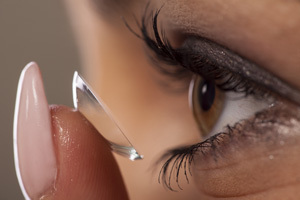 It will help us determine the type of contact lens that suits your vision needs. Also, this will measure the shape and health of your eye’s corona using several instruments that use the latest technologies to provide a comprehensive picture of the health of your eyes. Keratometers measure the amount of light that reflects from your cornea to determine the curvature of your eye’s surface. We use these measurements to choose the proper curvature and size for your contact lenses. Because keratometers measure the amount of light that reflects from a small portion of the cornea, we may use a computerized process called corneal topology to make additional measurements. This computerized process beams circular patterns of lights into your eye. This is used to measure how much light your corona reflects at any given time. These measurements are used to create an accurate digital map of the surface of your eye that is used to determine the correct curvature and size for your contact lens. We may also use computerized instruments to measure the size of your eyes’ pupils and the size of the colored part of your eyes known as the iris. These measurements are used to determine the correct diameter for your contact lens. The health of your eye’s surface is tested using an instrument known as a biomicroscope or a slit lamp. This instrument allows to evaluate the health of the front of your eyes. We use the results of this exam to determine the fit of a trial pair of contact lens that suits your needs. Your Exam May Also Include a Tear Film Evaluation. Some of our patients have problems with dry eyes. This problem is bothersome because it can cause itching problems that make wearing contact lens difficult. We use tear film evaluations to determine if you have problems with dry eyes. Tear film evaluations are tests that examine your ability to produce tears by placing a small piece of paper underneath your lower eyelid. The length of the paper moistened by your tears is used to assess if you have problems with dry eyes. After finding contact lenses that suit your needs, we write your formal perception for contact lens. Hence, this prescription will describe the power of your lens, a shape matching the curvature of your eye and the proper diameter. It usually takes two or three additional visits to complete a routine contact lens fitting. We use these visits to make sure that your contact lens fit well and correct your vision problems. After that, you should visit us once a year so we can monitor the health of your eyes. Keep in mind that an eye exam for contact lens typically costs more than a traditional eye exam. However, scheduling all of the tests needed to complete a contact lens exam in one place can help you save time and money because it can help you avoid taking duplicate eye tests. As a result, be sure to call us to schedule an eye exam for contact lens that can help you save time and money. Call 831.372.1500 or Email us for more information about this or any other of our services such as Corneal Refractive Therapy or Laser Vision Correction.